Things to read whilst transiting: The NYT Magazine asks which rock star will historians remember in 300 years? Hint: One of the star’s songs is traveling the cosmos. Things to listen to whilst transiting: Judge John Hodgman considers a case known as “Grand Theft Risotto” that brings together several strands, including a mom putting dog waste in her son’s car, the son putting his mom in a garbage can and the mom stealing a recipe from a daughter-in-law who stole the recipe from the internet. Almost as funny as JJH episode #204 starring me, me and me. 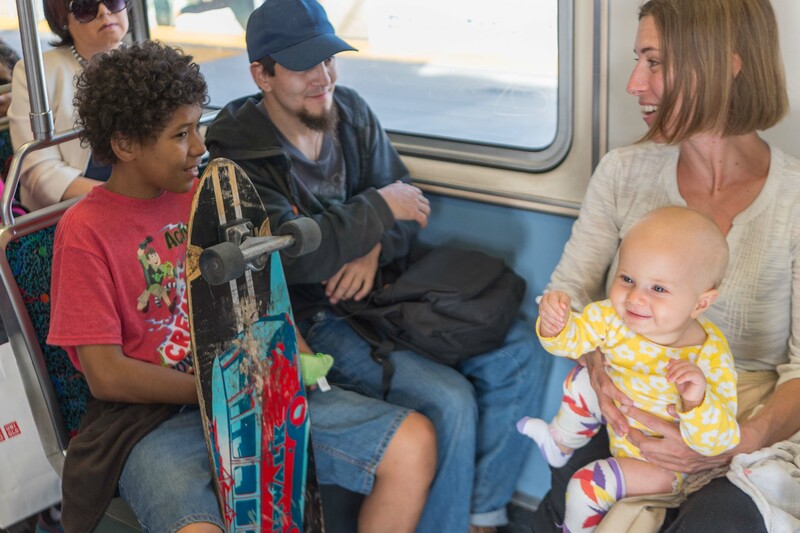 Babies + Transit on the Expo extension. Photo by Steve Hymon/Metro. For every frustrated commuter who shared a photo of a packed car or a full platform, another posted a selfie grinning next to an Expo Line sign or with a bicycle, rejoicing over getting to work without a car. As for the car that crashed through a fence and onto the tracks, I see that as a very unfortunate reminder of the daily carnage that motorists regularly inflict on themselves and other innocents — carnage which often sees little media attention. As for delays experienced by some riders later in the day, Metro officials say they will continue to strive to do better. I’m a sucker for these kind of stories even though they almost always end for transit the same way a Walking Dead episode ends for non-rotters: badly. Leo Duran’s trip from Union Station to the Santa Monica Pier took 90 minutes, not as good as the 65 minute trip by a colleague on a bike. Train delays slowed the westbound trip and then another colleague in a car beat Leo’s Expo train back to DTLA. As would be expected, a lot of folks are paying attention to the time of their commute when it comes to Expo. It’s interesting, too, that many riders aren’t so time sensitive and see Expo and other transit as a net gain of time to do things like catch up on work/internet/Game of Thrones. And still others have found that their transit trips are now faster. Of course, service on the new Expo extension is not yet four-days-old. This is a rail line that should be here for many decades to come. Is it fair to pull out the stopwatch and put Expo to the test? You bet. But let’s also see what the future holds as I don’t think the first weekday commute is necessarily going to be the best weekday commute. And from the Department of FWIW: I can’t begin to describe how heartbreaking it was to look down at my phone as I was heading out the door Monday morning and see the news about the car crash. The most gratifying part of this job is seeing actual everyday people get to use the projects they paid for with their taxes. And to see that jeopardized was about three degrees beyond awful. A smart story that looks at the many different tensions and arguments for and against rail expansion, both in L.A. and across the nation. The last word, I think, echoes the sentiment that Anna and I heard the most over the weekend: it’s great to have an alternative to sitting in traffic and trying to find parking. Along some transit lines there are signs of change. In LA’s Koreatown, Jimmy Han, owner of a craft beer bar and restaurant, examines his half-empty parking lot on a busy Friday evening. A few years ago it was jammed with cars on popular nights, but more patrons now walk from the train station about a block away. Any progress in getting Hollywood, Pasadena, Long Beach, Norwalk, El Monte….. put back on 2016 Metro Rail System Map? Replacing “Hollywood” type on the Map with “Central LA” type is a mark of gross stupidity. Frankly, it’s way too early to assess the reliability of the new Expo Line service. Just like the latest Gold Line extension, bad luck happens. The WSJ link was probably posted to be ‘fair and balanced’, but I rarely trust their knee-jerk conservative twist on everything. Wall Street is the home of ‘Short Attention Span Theatre’ where long term investment in anything is despised and derided.